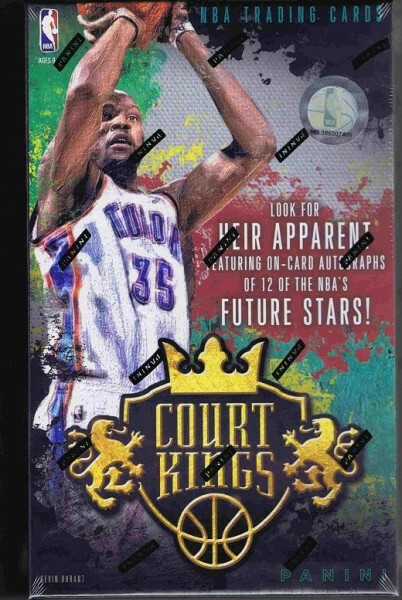 Factory Sealed 2014/15 Panini Court Kings Basketball Hobby Box mit 1 Pack a 10 Cards per Pack. 1 Autogramm, 1 Memorabilia Card, 1 Portrait Card, 1 Rookie Card und 2 Insert Card per Box! Produktinformationen "2014/15 Panini Court Kings Basketball Hobby Box NBA"
Factory Sealed 2014/15 Panini Court Kings Basketball Hobby Box mit 1 Pack a 10 Cards per Pack. 1 Autogramm, 1 Memorabilia Card, 1 Portrait Card, 1 Rookie Card und 2 Insert Card per Box !!! Das Box-Cover zeigt OKC Thunder Superstar Kevin Durant. LOOK FOR ON-CARD AUTOGRAPHS FROM THE 2014 NBA ROOKIE CLASS IN FRESH PAINT AND THE NEW SHORT-PRINT HEIR APPARENT! PULL UNIQUE MEMORABILIA CARDS WITH PRIME AND SUPER PRIME PARALLELS IN PERFORMANCE ART JERSEYS AND 2-ON-2 QUAD MEMORABILIA! FIND PRIME MEMORABILIA FROM ACROSS THE JERSEY SPECTRUM IN ART NOUVEAU: NUMBERS #'D/25, PATCHES #'D/10 AND NAMEPLATES WITH AN ENTIRE PLAYER NAME LETTER! CHASE SHORT-PRINT INSERTS IN ALSO KNOWN AS (#'D/49) AND LE CINQUE PIU BELLE (#'D TO THE PLAYER'S JERSEY NUMBER)! FIND HOT BOXES, FEATURING ADDITIONAL AUTOGRAPHS OR MEMORABILIA CARDS! Find 12 of the NBA's future legends in this new autograph set #'d/130! Chase down all four version of your favorite rookie's jumbo memorabilia card! Look for signatures from some of the NBA's best and brightest in this all-new on-card autograph set!. Check out five unique art styles featuring 33 stars from the 2014 NBA Draft Class #'d to as low as 10! Score a piece of signed artwork worth putting in a frame and hanging on the wall in this rare chase autograph set. Weiterführende Links zu "2014/15 Panini Court Kings Basketball Hobby Box NBA"
Fanbewertungen für "2014/15 Panini Court Kings Basketball Hobby Box NBA"